LONDON — James Herriot, who shared his experiences as a country veterinarian in the best-selling memoir “All Creatures Great and Small,” died Thursday in the Yorkshire Dales where he had ministered to animals for half a century. He was 78. He died of prostate cancer at his home near Thirsk, his granddaughter, Emma Page, said. “He had been ill for three years, but he had borne his illness very patiently and bravely. His family were all with him when he died peacefully at home today,” she said. Herriot — the pen name and alter ego of James Alfred Wight — wrote 15 books in the time that he could wrest away from his practice. They sold 50 million copies in 20 countries. But he continued his veterinary practice long after his books made him famous. “If a farmer calls me with a sick animal, he couldn’t care less if I were George Bernard Shaw,” he once said. The son of an orchestra leader who played background music for silent films, he was born Oct. 13, 1916, and grew up in Glasgow. He trained at Glasgow Veterinary College, arriving in Thirsk in 1940 for a now-famous job interview with Donald Sinclair — Siegfried Farnon in the book. He joined the practice and, aided and abetted by the hapless Tristan — Sinclair’s brother, Brian — settled in among the dour farmers of the Yorkshire Dales. He started writing when he was 50. Donald Sinclair, an English country veterinarian who was the model for a character in books by James Herriot, including “All Creatures Great and Small,” and in the television series of the same title, died on June 28, The Scotsman, an Edinburgh-based newspaper, reported on Monday. He was 84 and lived in Thirlby in Yorkshire. Mr. Sinclair was the inspiration for Siegfried Farnon, a character who has been called twinkly, avuncular and a bit absent-minded in his television incarnation. 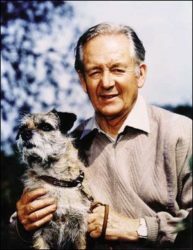 James Herriot was the pen name of Mr. Sinclair’s former veterinary partner, Alf Wight, who died earlier this year. The best-known Herriot book, “All Creatures Great and Small” came out in Britain in 1971. It is still in print, in the United States from St. Martin’s Press, Bantam and G. K. Hall. The Herriot stories center on the adventures of three veterinarians in Yorkshire before and during World War II, which is not surprising since Mr. Sinclair, his brother Brian, and Mr. Wight worked together there during that period. Donald Sinclair was said to have disliked the attention the stories drew to him. Brian Sinclair died in 1988, and Donald Sinclair’s wife of 53 years, Audrey, died last month. He is survived by a daughter, Jan, and a son, Alan. Joan Wight, the widow of the Yorkshire veterinarian who wrote under the name James Herriot and the model for a character in his books and television programs based on them, died on Wednesday. She was in her 80’s. Ms. Wight’s health slowly declined after her husband died in 1995 at age 78, said Thomas McCormack, the former editor in chief of St. Martin’s Press, which published the first five Herriot books. ”All Creatures Great and Small” became the basis for a long-running television series, which was originally a BBC-TV production and later a cable television series in the United States. Its accounts of rural life attracted an audience of millions around the world. On television, Helen was played first by Carol Drinkwater and later by Lynda Bellingham. In a 1979 movie, ”All Things Bright and Beautiful,” Helen was portrayed by Lisa Harrow. Although ”All Creatures Great and Small” became a best seller, it was not reviewed until months after its publication, when strongly positive word-of-mouth reports had begun to make it famous. One episode in the first Herriot book describes how Ms. Wight met her future husband. She grew up on a farm in Yorkshire not far from ”the surgery,” as Mr. Wight’s veterinary hospital was known. One day, she brought in a calf with a broken leg. Mr. Wight repaired the damage with a splint. Later, she brought in a dog with a dislocated hip, and this time, he had eyes only for her. They soon became engaged. Ms. Wight is survived by a son, James, and a daughter, Rosemary Page, both of Yorkshire in northern England.